Posted by contrapuntalplatypus in Flights of Fancy, Just for Fun, Music, Teaching, Through the Looking Glass. I played the piece for him and explained it was taken from one of the symphonies of Beethoven, a very famous composer. He nodded sagely as he pointed to the words “Ludwig van Beethoven” written on the right-hand side of the page above the music. Then he indicated Beethoven’s birth and death dates (1770-1827), printed below the name. “And here’s Beethoven’s phone number,” he proudly announced. Okay, admit it…could you have stopped yourself from nearly falling over laughing? Didn’t think so. Me neither. 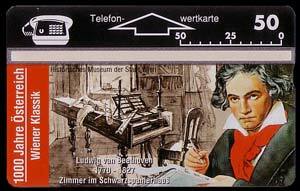 When I got a handle on myself again I explained to him that, regretfully, Beethoven had been dead for quite some time and, that even when he was alive, he was almost entirely deaf…so if telephones had been around in his time he wouldn’t have been able to use them at all.